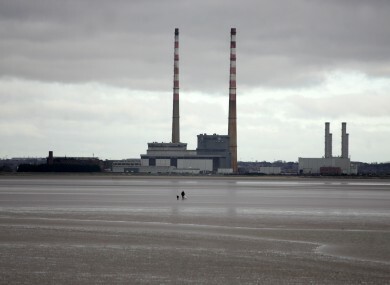 WORK IS DUE to begin on the controversial Poolbeg Incinerator within two weeks, after an agreement was signed between a US energy company Covanta and Dublin City Council. Dublin City Councillors had voted against the project earlier this month. However, TheJournal.ie spoke to three Dublin City councillors today who said they had not been informed by the council of the news – despite the fact they had voted on the issue a number of times. The decision on whether to proceed with the project or not was an executive decision for the Chief Executives of the four Dublin local authorities. “It would have been good manners and good practice to contact councillors,” said Sinn Féin councillor Daithí Doolan. I’m shocked that it’s going ahead. He described the situation as “short-termism” and raised questions about the suitability of Covanta. “It’s the wrong company in the wrong industry at the wrong time,” he said. Of the need for an incinerator, Doolan said that recycling has “come on leaps and bounds in Dublin” and he was concerned that as the incinerator will need to be fed, people may be disencouraged to recycle, or wast might have to be imported. “Even at this late stage, I’d make a public appeal to county manager to reverse his decision,” said Cllr Doolan. He is calling for such a committee to be set up for this project. “I would have thought at a very, very minimum – leaving aside issues of courtesy and manners – that such a body would have been set up in advance of work commencing. I genuinely think it’s quit disgraceful,” he said. Green Party councillor Claire Byrne had also not been told about the decision by the council, and said she and her colleagues “need some clarification on what’s happening”. Chief Executives in all four Dublin local authorities consulted widely with their elected members and presented detailed reports to them on options before signing. The Irish Independent reported this morning that work on the controversial incinerator is set to begin in two weeks, with the project agreement having been signed with Covanta. Dublin City Council confirmed to TheJournal.ie that mobilisation works will begin within two weeks, with Covanta setting up project offices on site. The project agreement was signed on Friday. Covanta is a US energy company which provides sustainable waste and energy solutions. In a statement on its website, Covanta announced on Friday that it has executed an agreement with DCC to “build, own and operate a new 600,000 metric tonne per year, 58 net megawatt Energy-from-Waste facility in Dublin, Ireland”. It also said that it has achieved financial close on a “comprehensive project financing package” and plans to commence construction of the project immediately. Construction will take approximately three years, it said, with a target of late 2017 for beginning operations. It said that the Dublin Waste-to-Energy Facility “will provide the Dublin region with a long-term sustainable and environmentally superior waste management solution”. When complete, the facility will generate clean renewable energy to supply 80,000 homes, reducing Ireland’s reliance on imported fossil fuel, and has also been designed with technology and infrastructure to provide enough heat to meet the equivalent needs of over 50,000 homes if a district heating system is implemented in the future. The total investment in the construction of the incinerator facility will be approximately €500 million. This will be funded by a combination of third party financing (€375 million) and project equity invested by Covanta (approximately €125 million). Covanta said the project agreement executed with the council will cover 45 years of facility operations, after which facility ownership will revert to DCC. Under the project agreement, Covanta will be responsible for sourcing waste supply for the facility, which will consist of residential, commercial and industrial waste streams from Dublin and surrounding areas. Email “Councillors surprised and shocked to hear work will begin soon on Poolbeg incinerator”. Feedback on “Councillors surprised and shocked to hear work will begin soon on Poolbeg incinerator”.